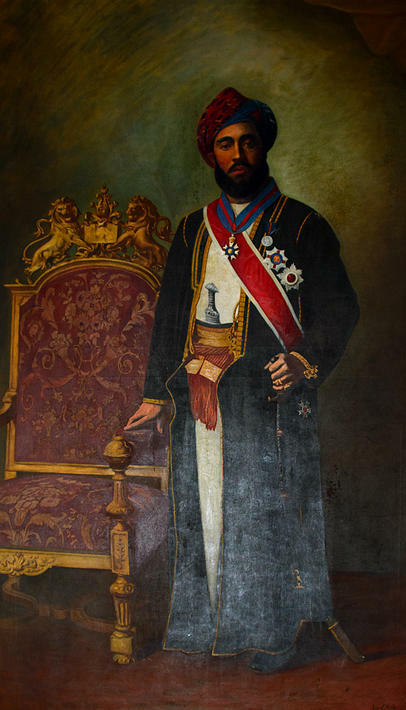 The Order of the Brilliant Star of Zanzibar (Wisam al-Kawkab al-Durri al-Zanzibari) is a decoration awarded by the Sultan of Zanzibar for meritorious services. Since 1963 it is reserved for the persons rendering extraordinary service to the Sultan, his heirs and successors and other members of the Royal family. Originally it was a state order from its inception in 1865 to the overthrow of the Sultanate on 12 January 1964 and currently is a House Order of the Zanzibar Royal Family. Current Grand Master is His Majesty Sayyid Jamshid bin Abdullah Al Said, Titular Sultan of Zanzibar. Initially the decoration had two grades, the first of which was usually awarded to foreign heads of state and the second which was further subdivided into five hierarchical classes. Currently the second grade only is being awarded. The Order was instituted by Sultan Sayyid Majid bin Said Al-Busaid in 1865, amended by Sultan Barghash bin Al Said on 22 December 1875, and amended again by Sultan Sayyid Khalifa II bin Harub Al Said on 5 August 1918. Both classes awarded neck medals in medallion form to be worn around the neck on formal occasions and breast badges, smaller awards which could be worn on the left breast like conventional medals. The neck medal was made of silver gilt, enamel and gold with a five pointed star surrounded by a wreath. The centre of the medal featured a portrait of the awarding Sultan for the first grade medals and the Sultan's monogram in gold on a red background for the second grade. The breast order was an eight pointed star in silver, again featuring the Sultan's portrait for the first grade and a monogram for the second. The ribbon for all medals was red with white edges.